Inscriptions: u.l. handwritten in ink: "Option? "; u.c. handwritten in ink: "may be the 3 green I (words + grass) should be printed after the two blues? "; c. handwritten in ink: "I want the words to be subtle but not look covered up - or rather that you did -"; b.c. 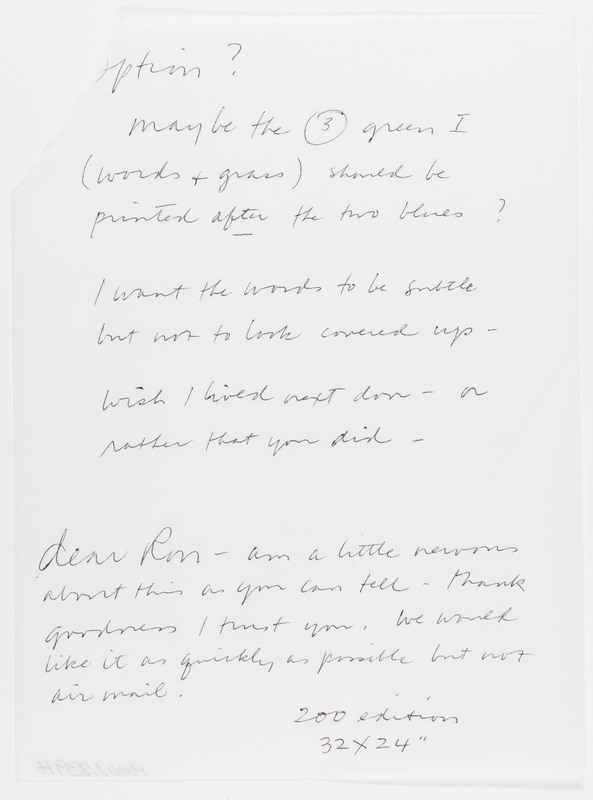 handwritten in ink: "dear Ron - am a little nervous about this as you can tell - thank goodness I trust you. We would like it as quickly as possible but not airmail. "; l.r. handwritten in ink: "200 edition [sic] 32 x 24"
"Untitled." Corita Kent in the Grunwald Center Collection. Los Angeles: Hammer Museum, 2017. https://​hammer.ucla.edu/​collections/​grunwald-center-collection/​corita-kent/​art/​untitled-layout-for-come-up-h/​.